That’s what mother of four Tina Robinson told AtlantaBlackStar of her struggle to find dolls that looked like her girls. The Philadelphia native recalls scouring the aisles of store after store to try to find her daughters an ethnic doll to put under the tree. As Christmas nears, Black mothers across the country are faced with the same dilemma they face every year. Do they buy their little girls one of the hundreds of white barbie dolls that line the walls of every Walmart and toy store or do they take on the task of finding a Black doll and shelling out the money for whatever such a specific doll may cost. Though there has been an increase in the availability of dolls of color on the market, a lot of the most common stores still don’t carry them. Currently Target.com has over 600 dolls for sale. Only around 30 of them are African-American, and some of them are almost double the price of their white counterparts. Earlier this month the Black Barbie Fashion Design Maker cost $49.99 at Target, while the white doll of the same make only cost $23.49. One father noticed and tweeted at the company to complain. “What’s wrong with this picture?” Warren Johnson wrote on December 7th. “When my daughter asked the question, ‘Why is the black doll more expensive than the white doll?’ I really didn’t have an answer for her,” Johnson told Cincinnati news source WCPO. Target has since lowered the price of both dolls to $20.99. 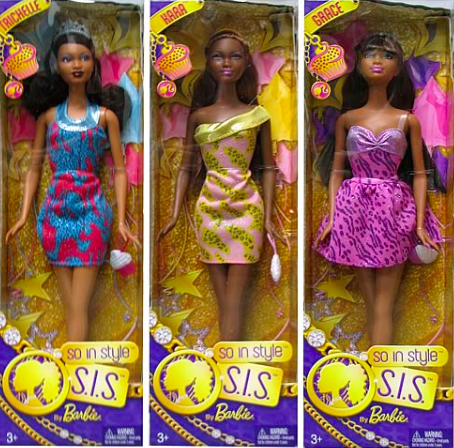 The problem isn’t just that these dolls aren’t available, but most times Black kids don’t even think to ask for them. They see the flashy white dolls on television and are disappointed if they receive anything different. But this is no new phenomenon. One of the first prominent appearances of the Black doll in America was in the 1947 Doll Study. Husband and wife African-American psychologists Kenneth Bancroft Clark and Mamie Phipps Clark presented children with two dolls that were completely identical except for their skin and hair color. One was a white doll with blonde hair and the other was brown with black hair. The children were then asked a series of questions such as which one they would rather play with, which one was nice, which one was bad, which one was a nicer color and other polarizing questions. The experiment concluded thee was a clear preference for the white doll among children of both races—a conclusion that was used to argue against segregation in the Brown vs. Board of Education court case. “During the era of my girls’ childhood, I found a good selection of African-American dolls, however, a few were not as attractive as the Caucasian dolls and did not reflect the beauty of African-American women,” said Lisa Muirhead, mother of two Jamaican-American girls.